Can I quickly share with you the stamping design I'm wearing today? 'Cause I'm really liking it. And I actually remember what I used this time! This way the leaves are facing up, but the other way the leaves are tilted. I think I like the first way better because it looks like the leaves are blowing in the wind and falling to the ground. September has been fantastic. It went by way too fast and I'm a little sad to see it go. But, like I always say, I wish it was October all year round, so I'm ready for it! These make me swoon. Totally love that look and feel. j'adore! what a stunning look! perfect for fall. Great job, Scrangie. Definitely reminds me of fall. Good colour choices. Love, love, LOVE. I like the leaves the first way as well. Such a nice color combo. I love when you get creative, it pushes the creative monster in me! Very nice! 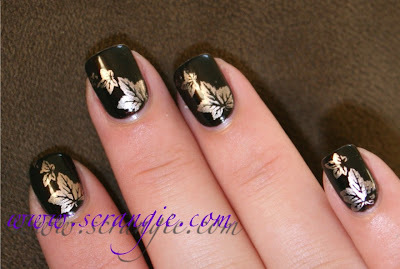 I love the leaves and the black & gold combo. Very pretty! I love October too!! It's always been my favorite. Love the changing of the seasons, but somehow the change from hot to cool is so energizing. Lovely. Your stamping is perfect! Love the look. Great color choices for fall. Very cute. I can't wait for the weather to get a little cooler to rock the fall colors and designs. This looks awesome. This is cute. Great color and design for fall. this is way gorgeous! i really like it! I also like the leaves the first direction shown as well too. I have this shade from SpaRitual. Somehow I got the entire fall set early in July. I have no idea how - I just lucked out from someone who had PR connections that one time. So I have had fun with that collection, but now really feel like wearing them - though we need to cool off where I live about 20 more degrees in an avg day at least. i think we are going to go from summer directly into winter like happened here last year. This is so pretty and classy and perfect for fall! It looks gorgeous. Have to try it =). I really love this mani and last autumn I did somethin similar. I like the first way better, too. That's a pretty fall mani! I like the color combination! 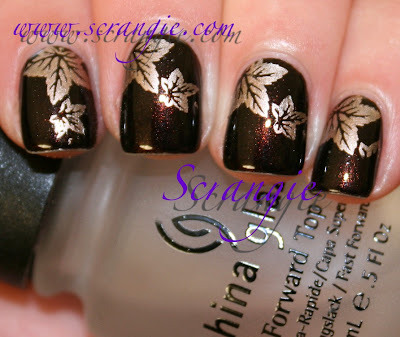 I am not into brown polishes but with this stamping design it looks nice! I must try this look out myself! I'm not normally a fan of nail art/stamping but I really liked this, both colors and theme! So beautiful. I love leaf designs. This is really stunning. LOVE IT!!!!! I only have one stamping plate.Im sad september ends today. that mean the sale on seche clear and seche vite BOGO Free ends today at Sallys. I guess i will have to pop over and grab some more!!! I like them tilted better! I love this combo and need to try it myself! So simple but so awesome! LOVE THIS! I may recreate this...it just screams fall! It is gorgeous! Very fall-like! Hey! I have this color too! I was gonna purge it but I might give it another try. xoxoxo have a good weekend! I love fall too. Wow that is really pretty, I just recently stumbled across your blog here, and I am obsessed with doing my nails and you have so many great reviews for products I will definitely be trying out. I have a quick question for you though... do you have any tips for keeping nails from turning yellow when you remove nail polish? Thanks! it's hard to spot the difference, but once you mentioned it the tilted looks better! love the design! That is so perfect! Makes me want to go on a drive to see all the changing leaves! Very nice! Sinful Colors Rich In Heart works well for stamping fall leaves too. That is amazing! Where do you get the leaf stamp? So beautiful! I love the way the leaves look like they're falling too! Fall always goes by too quickly, *sigh*. It's my favorite time of year and it always flies by, the holidays arriving overnight... I wish it was October all year round too! I insanely love this. I totally agree with wishing it were October all year round.